I was at the grocery store making my way for the checkout counter when I saw the sign near the flowers. The sign was for discounted flowers, which I thought would mean the stems wrapped in cellophane. Then I saw a couple of Phalenopsis and some bromeliads. I debated for a second whether or not to buy it. The price was $5, marked down from $20. It was a steal. 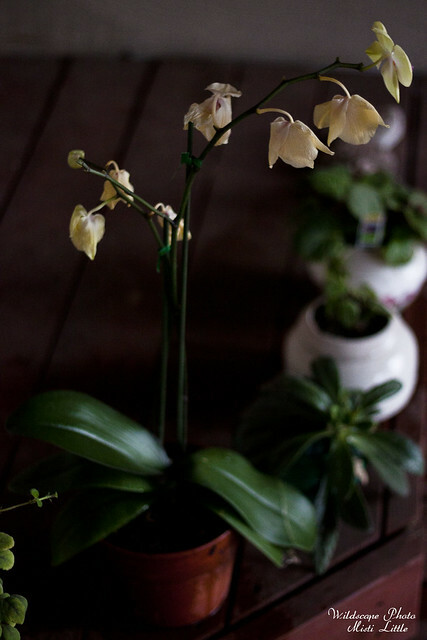 The plant was in good condition and with proper care will bloom again and grow just fine. The only reason it was marked down was because the flowers were done….or are they? Sometimes if you don’t cut the spike off of Phalenopsis you will get a second set of blooms and I can already tell that the secondary spike is likely to bloom again. So. I bought it. We are in a zone that experiences some frost and freezes more often than where we lived in Florida so taking care of them will be more difficult. I’m brainstorming a possible greenhouse (aka: trying to convince my husband) on the spot where a weird cement slab is between our carport and man-cave. 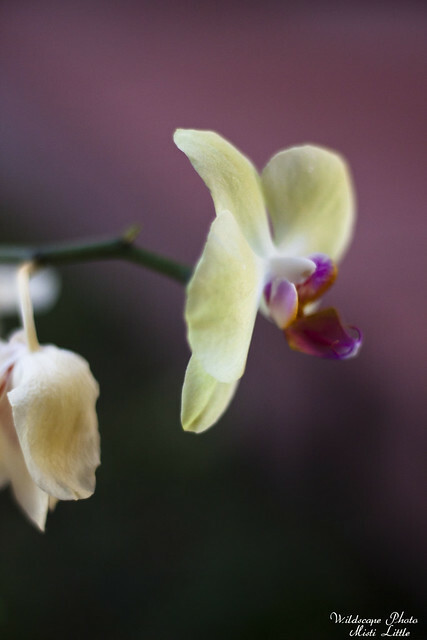 Then we could grow more orchids and other tropicals all year. I brought it home and repotted it in a clay pot with orchid bark, removing as much sphagnum moss as I could without harming the roots. We’ve had much better success with orchid bark versus the moss as we feel the moss leads to more rotting and orchid death. Luckily Chris’ dad had brought some orchid supplies with him a few weekends ago so I had some stuff on hand to repot. I have no idea what specific hybrid this is but I don’t really care. It is purty and it makes me happy! Oh, how pretty! 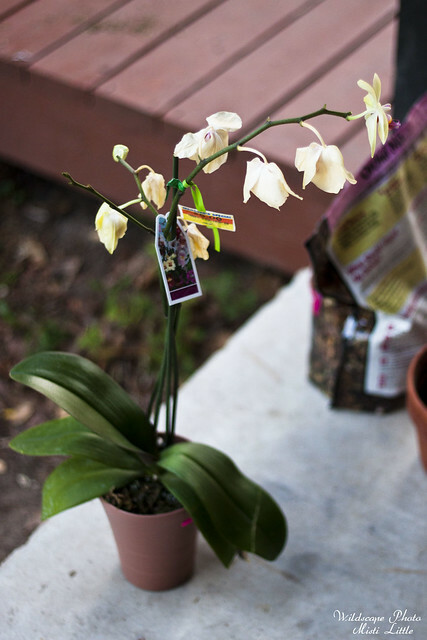 I love orchids, but it turns out I’m an orchid murderer. We like our place too cool and dry for them, turns out, so then I accidentally drown them. With love, I swear! So I have to talk myself out of buying them whenever they’re on the discount rack. I’d love to see pics when this one blooms again! This is beautiful. 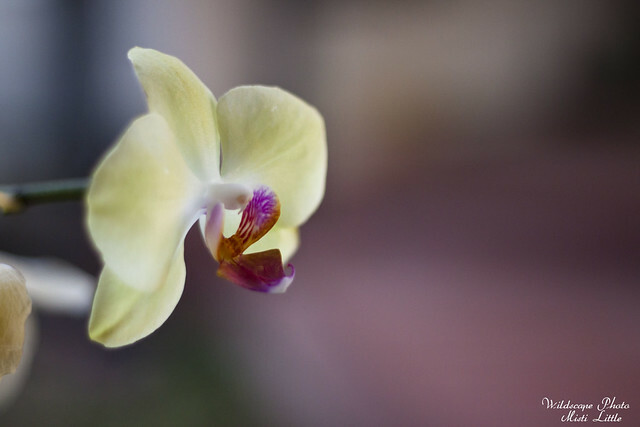 I love orchids- I have to restrain myself from loading up the cart with them whenever I see them at the grocery store or Home Depot. And our local nursery has rows of rare ones that I always have to avoid because I’m always tempted to take on the challenge of a very complicated plant.